Zip Cloud is available right in your pocket, from iPhones to Androids to Windows Phones to Blackberrys, there is an app available. This invaluable service is great, however it is really important to secure your device so that if it does fall into the wrong hands, all your backed up files are safe. Our mobile apps come with the ability to set up a pass code and we strongly advise setting one up if you have valuable, private data in your Zip Cloud. Having a passcode means each time Zip Cloud is opened on your phone you will be required to enter a 4-digit memorable number in order to access your files. 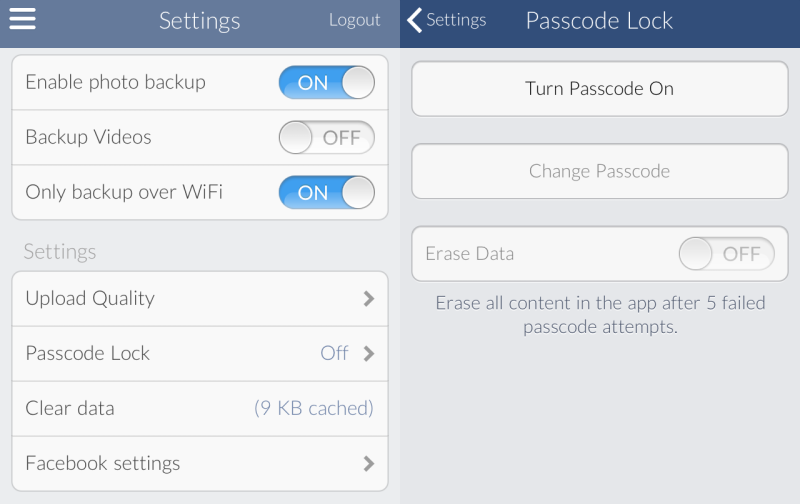 To set up a passcode simply go into the app's settings and tap passcode. You will need to enable passcode and enter in your desired code twice. As well as securing your Zip Cloud it is also a good idea to set up a passcode to unlock your device as well. Swipe patterns seem more convenient than passcodes, however greasy smudges on the screen can reveal the pattern easily to a potential thief. Just think of the potential access someone would have if they got on your unlocked phone? Emails, social media, banking apps and info, basically a big chunk of your digital life! Most smart phones come with the ability to set up an auto-lock time setting meaning you can set how long your phone remains idle for before it locks automatically. Really you need to set this auto-lock time for as short a time as you can bare, thieves strike quickly and access to your phone could potentially give them time to turn off location settings and prevent you ever seeing your precious phone again. It seems like system updates get in the way of using our devices, often we find ourselves waiting for download and install progress bars to finish so we can get on with our smartphone activities, but it really is important to not ignore updates. Apple's much awaited iOS 7 came under scrutiny last month when users quickly found a lock screen vulnerability giving access to some apps on iOS devices. Apple quickly patched the hole and released an update. Finally on the security front we want to discuss Wi-Fi and Bluetooth, both make connecting to the internet and other devices a breeze but just how much information are you sharing when out and about? Well, if your phone is constantly searching for available Wi-Fi networks this will be communicating information about you and your location. Connecting to open networks can be risky as well, anyone who knows what they are doing could be tracing and decrypting all the information (including passwords) that you are using. So be careful what networks you choose to connect to, look for Wi-Fi hotspots provided by your carrier or home Internet Service Provider for safer surfing. Bluetooth should be turned off when not in use, if in-use though, never accept access requests from unknown devices - the bad guys can gain access to devices and data using Bluetooth. We will be running through other security topics throughout October, be sure to share these tips with others who you share information with.